This is a twist on an old favourite. It’s a great way to use eggplants without using loads of oil to cook them. You can also substitute the veggie sausages with zucchini or kumara. Serves 2, prep time 25 min, cook time 45 min. Preheat oven to 180C and lightly grease a loaf tin. Dice onion and place in a small pot with oil, sauté for a couple of minutes then add garlic and mixed herbs, cook for a further 1 minute before adding tomatoes, water, tamari, honey and chilli flakes. Bring mixture to a simmer and cook for 5 minutes until sauce reduces slightly. Taste and season with salt and pepper. 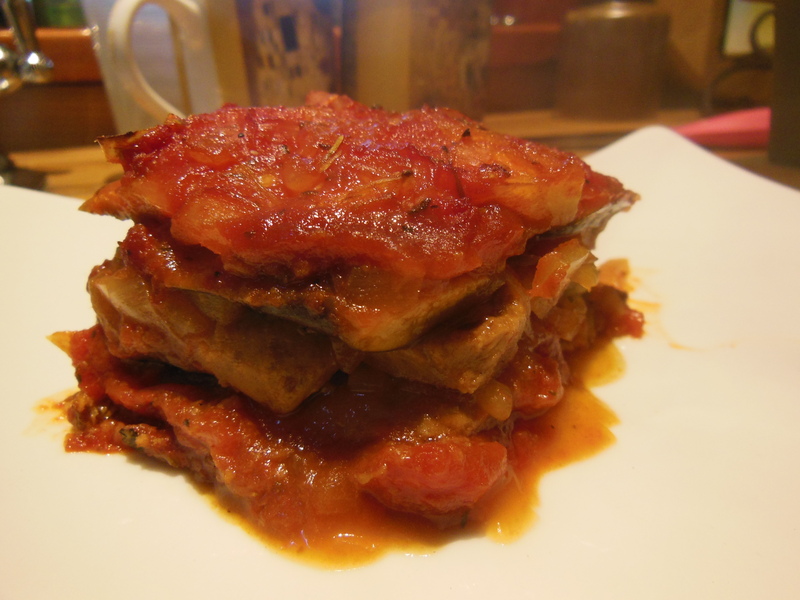 Slice eggplant length ways into ½ cm strips and spread each side with a little of the curry paste. Thinly slice the veggie sausages and set aside. In loaf tin spoon a small amount of the tomato mixture followed by a layer of eggplant, more tomato then a layer of sausages. Repeat until all the ingredients are used up and pour any extra sauce over top. Cover with lid or tin foil and bake for 45 minutes, then remove foil and bake for a further 5 min. Serve with fresh greens and my cauliflower rice.